Kevin Harvick started 13th, finished fifth and scored six bonus points. The No. 4 Jimmy John’s Kickin’ Ranch Ford Fusion raced into the top-10 shortly after the green flag. Harvick reported that his car was too tight in the corner to make a run to the front early in the race. The Jimmy John’s Ford came to pit road on lap 39 under green-flag conditions for four tires, fuel and an air pressure adjustment. Harvick raced his way into the top-five by lap 63 as the handling conditions improved on the longer run. The No. 4 Jimmy John’s Kickin’ Ranch Ford came to pit road for four tires, fuel and an air pressure adjustment at the conclusion of the stage. Harvick and the pit crew picked up three positions on pit road and came out in the second position. Started second and finished first to score 10 bonus points and a playoff point. Harvick challenged teammate Aric Almirola for the lead at the start of Stage 2 before settling into the second position. Harvick came to pit road under green-flag conditions on lap 122 for four tires, fuel and an air pressure adjustment. The No. 4 Jimmy John’s Kickin’ Ranch Ford raced to the lead at the end of the pit cycle. The Jimmy John’s Ford came to pit road for four tires, fuel and an air pressure adjustment on lap 129. The team came out in the fifth position as Ryan Newman stayed out and Ryan Blaney opted for a two-tire strategy. 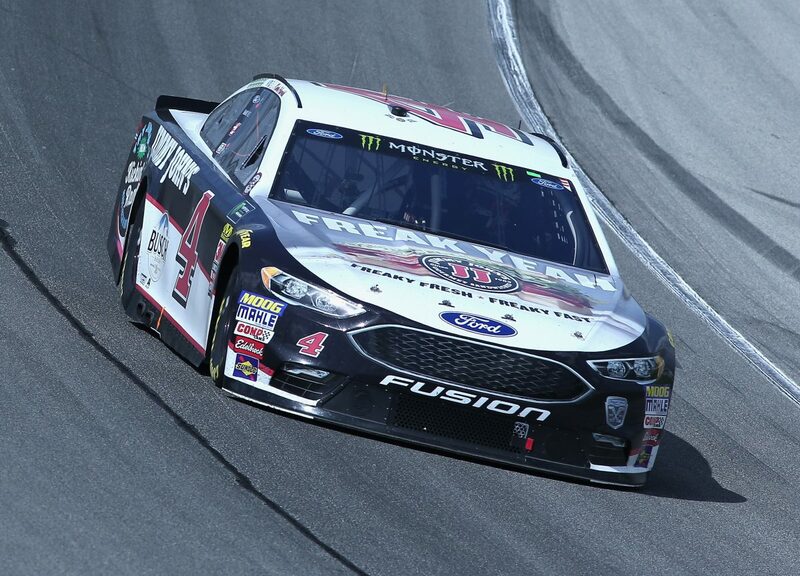 Harvick raced hard to complete the pass of teammate Kurt Busch for the lead on the final lap of the stage to score his ninth stage win of the season. The team came to pit road for four tires, fuel and an air pressure adjustment at the conclusion of the stage. Started first and finished third. Harvick’s No. 4 Ford got tight on the restart, and he dropped back to the fourth position. He was able to recover and race back to the lead by lap 176 before the caution flag flew. Harvick brought the Jimmy John’s Ford to pit road for four tires and fuel on lap 178 and restarted fourth as two cars stayed out and another opted for a two-tire strategy. The No. 4 Jimmy John’s Kickin’ Ranch Ford raced back to the lead on lap 186. The team gave up the lead to come to pit road under caution on lap 209 for four tires and fuel and came off pit road in second. Harvick battled hard, but a tight handling-condition in the closing laps prevented him from racing for the win. This was Harvick’s series-best 13th top-five and 14th top-10 finish of 2018. Harvick earned his 10th top-five and 11th top-10 in 18 career Monster Energy NASCAR Cup Series starts at Chicagoland. He finished fifth in Stage 1 to earn six bonus points and won Stage 2 to earn an additional 10 bonus points and a playoff point. Harvick led six times for 39 laps to increase his total at Chicagoland to 471. Harvick’s 39 laps led puts him at 1,032 for the season. He has now led more than 1,000 laps for the fourth time since joining SHR in 2014. Kyle Busch won the Overton’s 400 to score his 48thcareer Monster Energy NASCAR Cup Series victory, his fifth of the season and his second at Chicagoland. His margin of victory over second-place Kyle Larson was 1.875 seconds. There were five caution periods for a total of 23 laps. Only 15 of the 39 drivers in the Overton’s 400 finished on the lead lap. The next event on the Monster Energy NASCAR Cup Series schedule is the Coke Zero Sugar 400 on Saturday, July 7 at Daytona (Fla.) International Speedway. Coverage of the race begins at 7 p.m. EDT on NBC.